Cougar Self :She Moves in Grace evolved out of my own knowing that my energy was related to the cougar and could shift to that at any time. 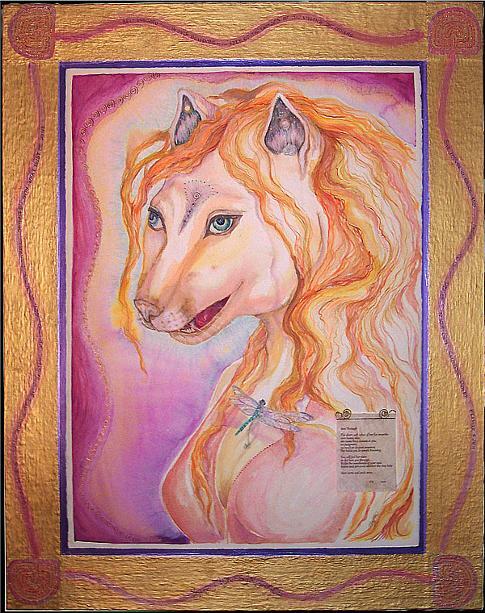 She is a powerful aid both in protection, in endurance and "spiritually stalking" information or situations as well as a nod to my sometimes solitary nature. 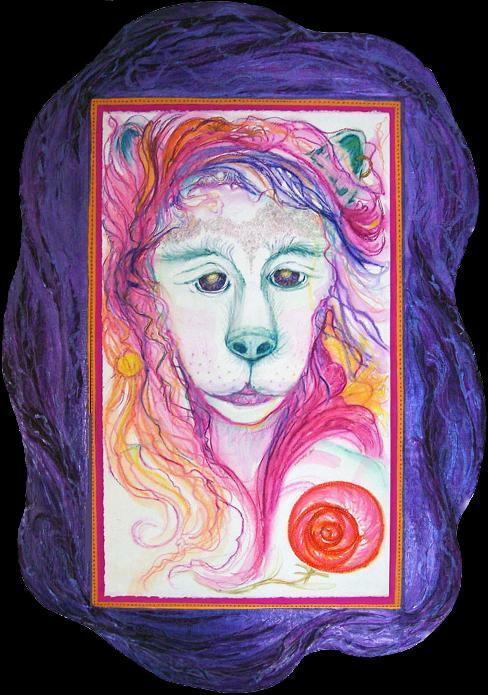 This sweet painting of the Inner Child or Soul Self in its wild, original state is surrounded by a three dimensional integrated frame that compliments it in mood and color. It is not glass covered but that can be negotiated. 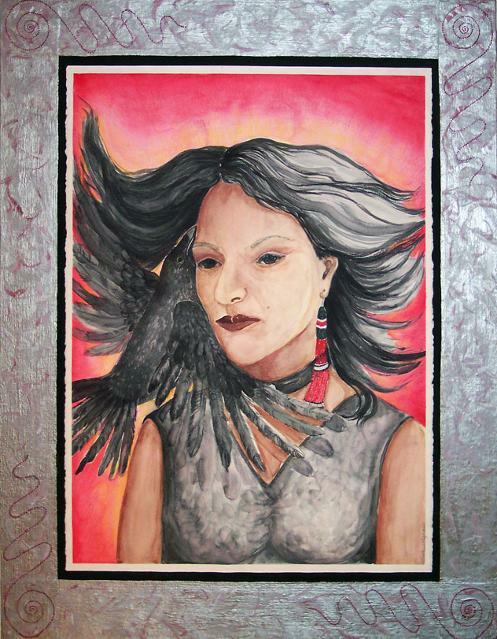 An integrated frame with feather images on it surrounds this painting of Crow Mother as she enfolds a couple with her powerful fire energy. Empowered movement and fluidity characterise this piece. It is not glass covered but that is negotiable. 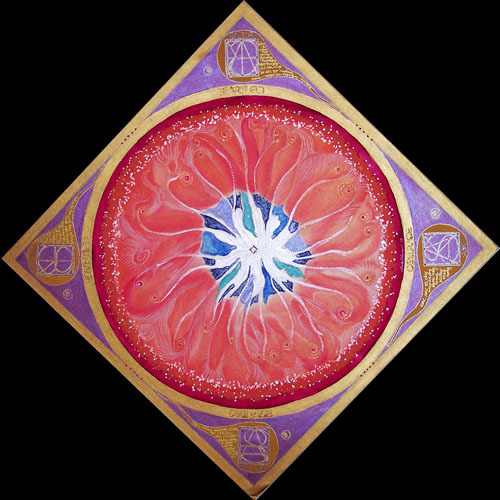 Sexuality Mandala has been created as a meditation to build sexual energy that may then be moved through out all the chakras. The meditation starts with focus on the outer most edges and then gradually moves to the center areas. 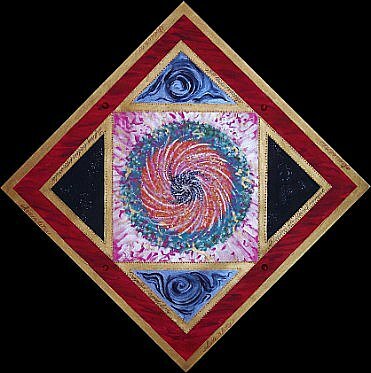 Masculine Mandala has been created as a meditation focus to help connect with masculine energy in either males or females. It is meant to connect the two and bring balance to them both. 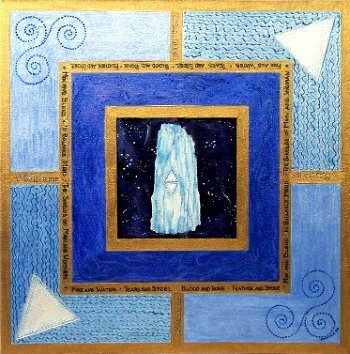 An energetic experience , it came to me out of a meditation that I was given which included a powerful altar of huge size, all of blue kyanite as shown in the center of this piece. The medium blue area around that is filled wtih spirit creatures that can't be seen here. The meditation starts with focus on the outer most edges and then gradually moves to the center areas. "Space is thick and thin or open and dense layers of energy which dance back and forth in different configurations. We are able to move thru them in our shamanic dreaming and connect with that which is there, thru our own energy configurations. As we interact with these energies, we grow our own, yet the closer we move to SOURCE, and the more we open, the more our individuality dissipates and integrates with SOURCE. We learn to function in the ways of energy, rather than the physical. 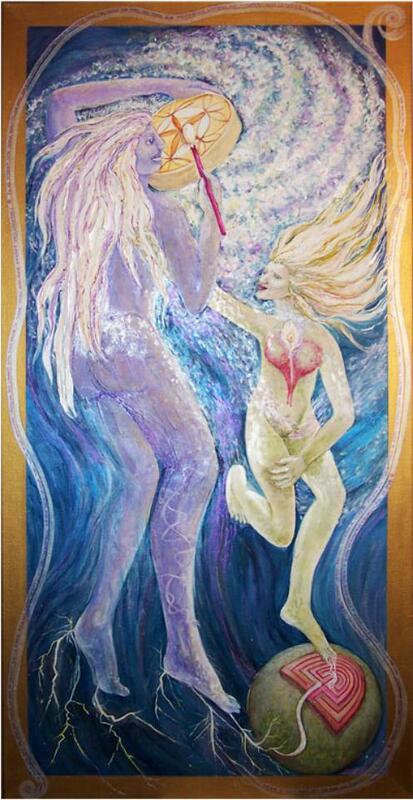 All is a huge Connected circuit that pulses alternately with masculine and feminine energy. These figures have created a circuit of such energy and the female holds it in balance with her opened heart, a symbol of compassion. SOURCE is just that yet we are the flames within that flame. 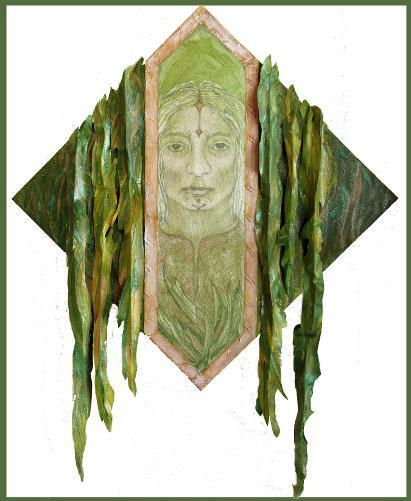 Thru our work, we stabilize and integrate that raw energy, helping to create and recreate SOURCE which is also ourselves. ALL Is One." Seeing the painting in real life , you would find there are a number of spirit figures integrated into the dark background and other symbols as well. 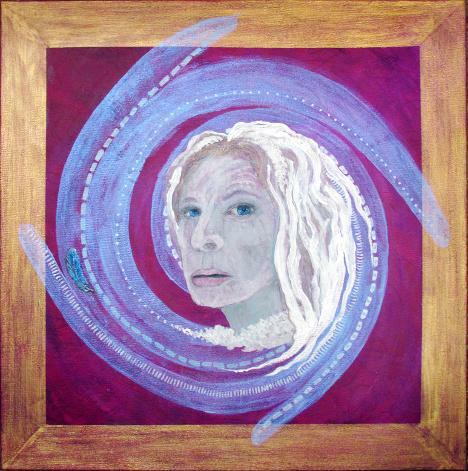 Acrylic on canvas and pencil on paper collaged to canvas 20" x 20"
Magical One: is a piece created to produce healing energy for directing it to all of its surroundings. 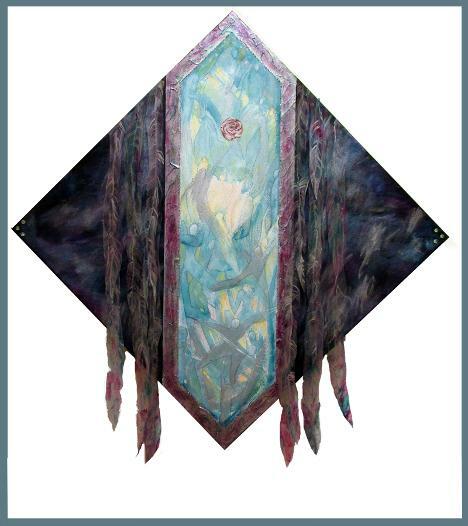 There is much prayer and good energy instilled into the piece. Its arresting gaze holds the eye as one of a benevolent protector. Luna Transformations of the New Moon represents a significant shift in directions for me in both media and design. 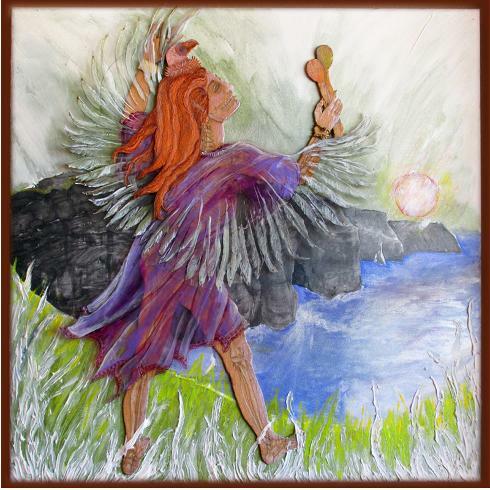 As my personal life is changing, so my work is changing though my spiritual connections remain constant and grow stronger. 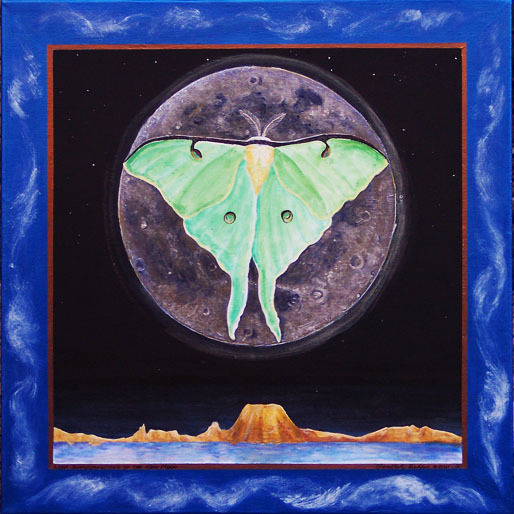 The New Moon and the moth/ butterfly symbols both represent death and transformation into new awareness, new being against the background of Universal Constancy. 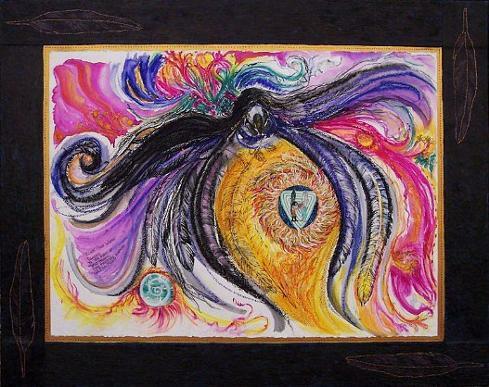 Courage Mandala has been created as a meditation focus to clear fears and blocking energy. It is an opening process that allows for new vision of possibilities. The meditation starts with focus on the outer most edges and then gradually moves to the center areas. 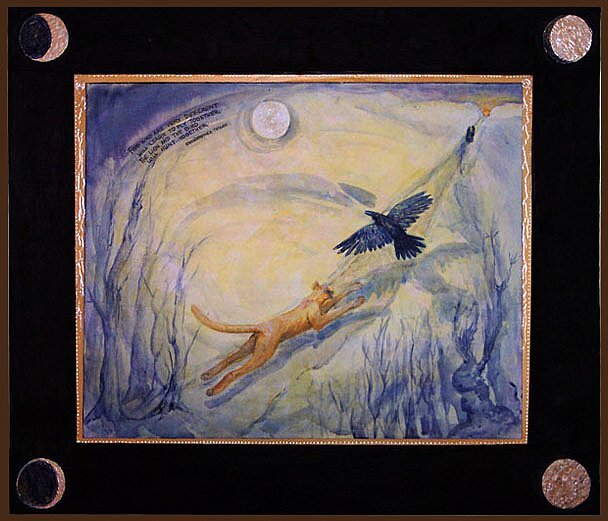 Cat and Bird Must Learn to Fly Together Watercolor and colored pencil this piece came from a dream image showing a Cougar with an Eagle flying above it on a moon lighted night.